Steep and short 5.7 hand jams lead to a short traverse to the upper part of Swan Slab gully. If leading or toproping, be sure to set protection before the traverse. 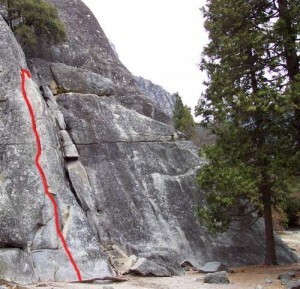 To set a toprope, either climb the route or climb Swan Slab Gully. Beware that Swan Slab Gully is so awkward that some climbers may actually find Penelope?s Problem easier despite its harder rating. Which SuperTopo guidebooks include a topo for Penelope's Problem?